Americans overall are more likely to say that newcomers from other countries strengthen American society (50%) than they are to believe that they represent a threat to American customs and values (34%). Sixteen percent affirm or reject both statements, or offer no opinion. While there was some fluctuation in attitudes about immigrants over the past year, no weekly survey conducted between May and December 2015 registered more than four in ten Americans agreeing that immigrants represent a threat to American culture. 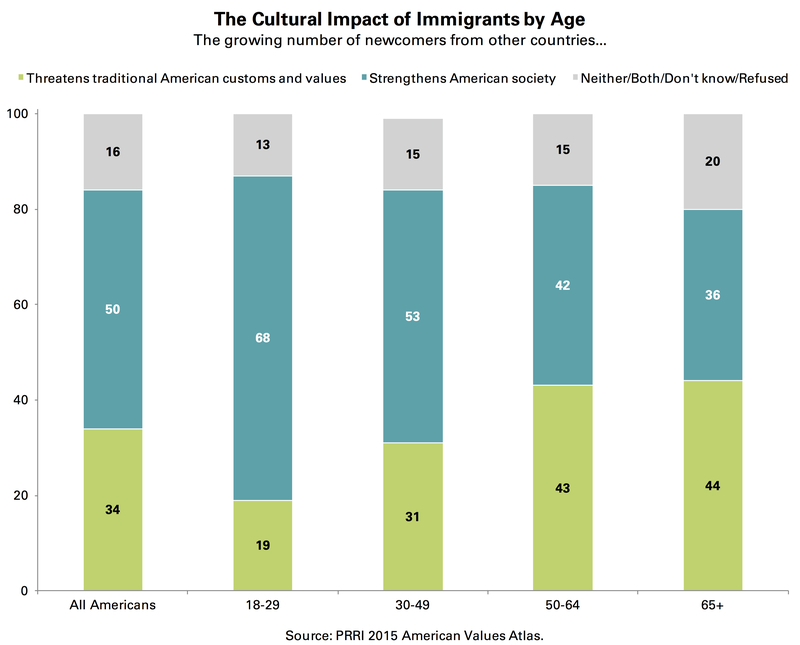 There are striking generational differences in attitudes about immigrants. More than two-thirds (68%) of young adults (age 18 to 29) say that immigrants coming to the U.S. strengthen the country, while fewer than one in five (19%) say that immigrants threaten traditional American customs and values. In contrast, only 36% of seniors (age 65 and older) believe that newcomers strengthen American society, while close to half (44%) of seniors believe that immigrants coming to the U.S. are a threat. Notably, 12% of seniors offer no opinion on this issue. American attitudes toward immigrants also vary markedly by race and ethnic background. At least two-thirds of Asian-Pacific Islander (API) (70%) and Hispanic Americans (67%) believe newcomers are a benefit to American society. A majority (56%) of black Americans also affirm a positive view of the influence newcomers have on American life. White Americans, in contrast, are closely divided about the impact of immigrants: close to half (45%) of white Americans say that immigrants represent a positive influence in American society, while four in ten (40%) believe newcomers are a threat to traditional American customs and values. Even among whites, there is a considerable generational divide about the impact of immigrants. More than six in ten (63%) white young adults say that newcomers from other countries strengthen the U.S., compared to fewer than one-quarter (24%) who believe they are a threat to American customs. White seniors are more likely to perceive immigrants as a threat (47%) than a benefit (34%) to the country. There are also important differences among whites by educational attainment. Nearly half (48%) of whites with a high school degree or less believe immigrants threaten American customs and values, a view shared by only about one-third (31%) of whites with a four-year college degree and only one-quarter (25%) of whites with a post-graduate education. A majority of college-educated whites (55%) and whites with a post-graduate degree (62%) say that immigrants strengthen American society. Religiously unaffiliated Americans, those who belong to non-Christian religious traditions, and non-white Christians hold the most positive views of immigrants. At least seven in ten Unitarian Universalists (81%), Hindus (73%), Muslims (72%), and Hispanic Catholics (70%) say that newcomers coming to the U.S. strengthen the country. Roughly two-thirds (65%) of Buddhists and about six in ten religiously unaffiliated Americans (61%) and Hispanic Protestants (60%) also affirm the positive contribution immigrants make to American society. White Christians express substantially more ambivalence about immigrants. Fewer than half of Mormons (45%), white Catholics (44%), and white mainline Protestants (41%) believe immigrants strengthen the country. Roughly four in ten Mormons (38%), white Catholics (41%), and white mainline Protestants (43%) say that immigrants present a threat to American culture. White evangelical Protestants stand out as the only religious community in which a majority (53%) believe that immigrants threaten traditional American customs and values. Only about one-third (32%) of white evangelical Protestants believe newcomers from other countries benefit the U.S. Even among more conservative religious communities, the generational differences are substantial. A majority (55%) of young white evangelical Protestants say that newcomers from other countries strengthen American society, while one-third (33%) say they present a threat to American culture. Conversely, a majority (57%) of senior white evangelical Protestants say immigrants threaten traditional American customs and values, while fewer than one-quarter (23%) believe they strengthen the U.S. There are significant differences in attitudes toward immigrants between white evangelical Protestants who hold a four-year college degree and those without. Nearly six in ten (57%) white evangelical Protestants with a high school degree or less education believe that immigrants threaten traditional American culture and values. Only about one-quarter (26%) say immigrants strengthen American society. College-educated white evangelical Protestants are more divided: while 44% say immigrants are a threat, nearly as many (41%) say immigrants strengthen American society. A majority (53%) of Republicans say that immigrants constitute a threat to traditional American customs and values; roughly one-third (32%) say they strengthen American society. 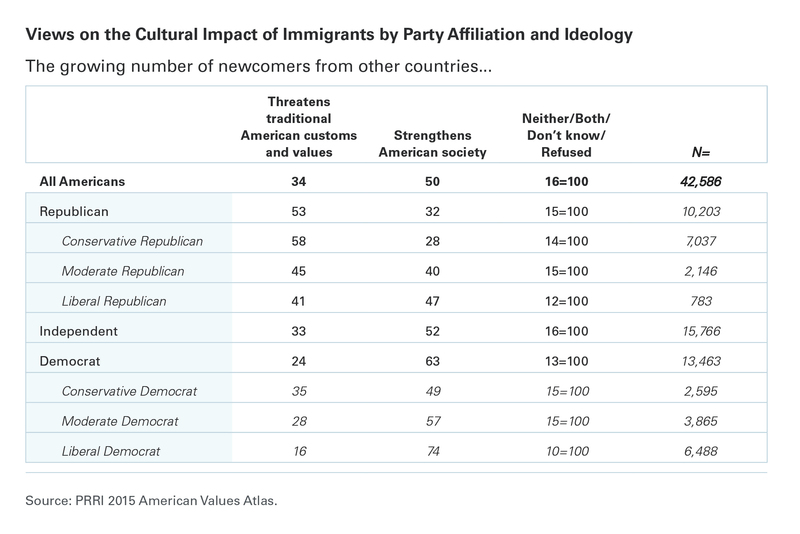 In contrast, a majority of independents (52%) and Democrats (63%) say that newcomers from other countries strengthen American society. However, there are considerable ideological divisions among both Republicans and Democrats. Nearly six in ten (58%) conservative Republicans believe that newcomers present a threat to traditional customs, while moderate and liberal Republicans are divided. Close to half (45%) of moderate Republicans say immigrants are a threat, compared to 40% who say they offer a positive contribution to American society. Similarly, roughly four in ten (41%) liberal Republicans see immigrants as a threat to American culture, while 47% say they strengthen American society. Among Democrats, conservatives (49%) are much less likely than moderates (57%) or liberals (74%) to say immigrants strengthen the country. There are also substantial generational divisions among Republicans. A slim majority (51%) of young Republicans (age 18 to 29) say that immigrants strengthen American society, compared to 36% who say they threaten American society. In contrast, Republicans over the age of 30 are more likely to believe immigrants pose a threat to American culture and way of life. Among seniors (age 65 and older), only 22% believe that immigrants strengthen American society, compared to 61% who say they are a threat. Notably, areas of the country that have been historical centers of immigration hold the most positive views of immigrants, but attitudes are more positive than negative in every region. A majority of Americans living in the West (55%) and Northeast (54%) believe that newcomers from other countries provide a positive contribution to the U.S. Fewer than half of those living in the South (48%) and Midwest (46%) agree. Close to four in ten Americans living in the Midwest (38%) and South (37%) say immigrants constitute a threat to traditional American culture and values. With the exception of Wyoming, attitudes about immigrants are the most negative in the Deep South and the Appalachia region. Nearly half of residents in Wyoming (48%), Alabama (47%), and West Virginia (47%) believe that immigrants pose a threat to American culture. More than four in ten residents living in Kentucky (44%) and Arkansas (44%) also believe that immigrants represent a threat to American culture and values. Conversely, roughly six in ten Americans living in Hawaii (60%), Massachusetts (60%), California (58%), Rhode Island (58%), and New York (58%) say that immigrants are a positive influence on American society. Click here for a 50-state table of views on the cultural impact of immigrants. Americans express consistent support for providing immigrants who are currently living in the country illegally with a path citizenship. 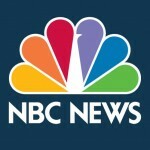 More than six in ten (62%) Americans say immigrants who are currently living here illegally should be allowed a way to become citizens provided they meet certain requirements, while 15% say these immigrants should be allowed to become permanent legal residents but not citizens, and about one in five (19%) say illegal immigrants should be identified and deported. Attitudes on this question have remained remarkably stable throughout 2015. 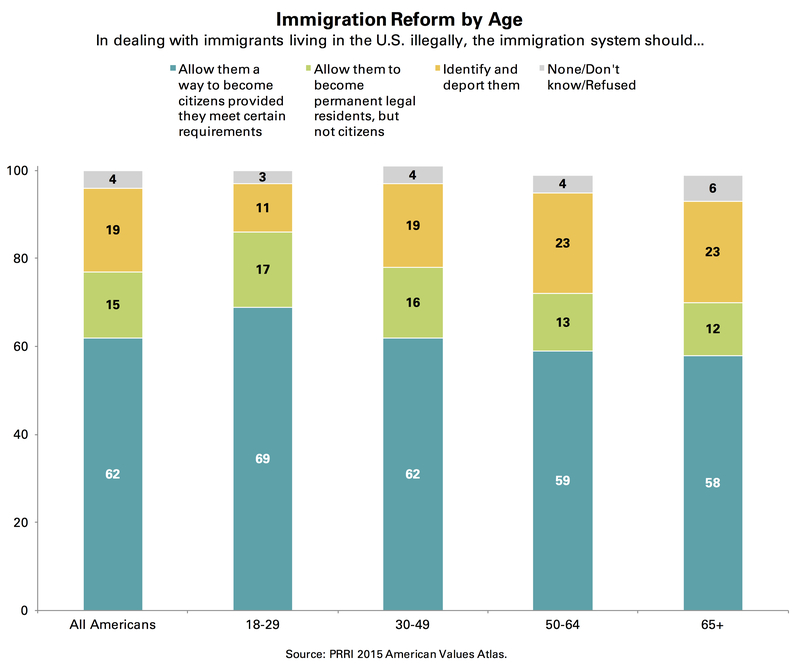 Immigration reform policy preferences vary only modestly by age. Nearly seven in ten (69%) young adults (age 18 to 29) support a path to citizenship for immigrants living in the country illegally, 17% support permanent resident status but not citizenship, and only about one in ten (11%) favor identifying and deporting these immigrants. Nearly six in ten (58%) seniors (age 65 and older) also support a path to citizenship, 12% support permanent resident status but not citizenship, and about one-quarter (23%) express support for deporting immigrants living in America illegally. 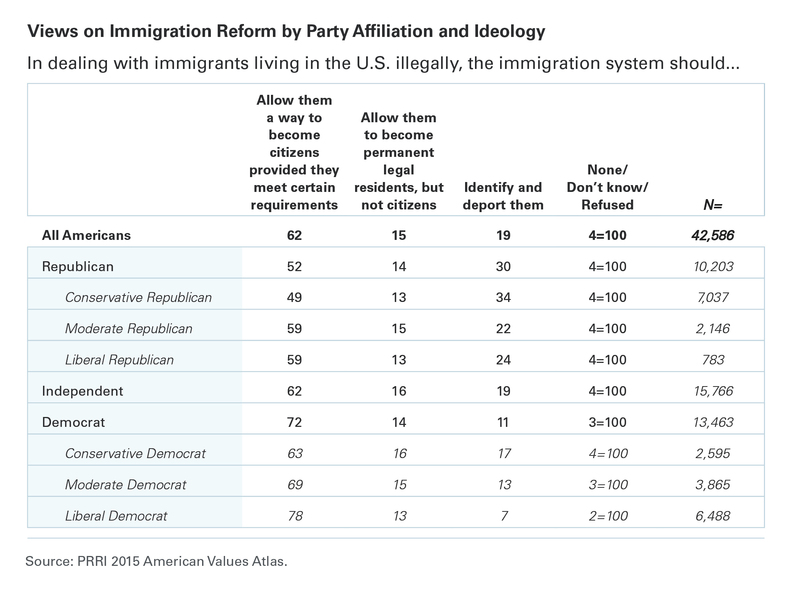 There are also racial and ethnic divisions in attitudes on immigration reform. Black (69%) and Hispanic Americans (67%) express the strongest support for providing illegal immigrants with a path to citizenship. Roughly six in ten white (60%) and Asian-Pacific Islander (API) Americans (57%) also support allowing immigrants living in the U.S. illegally an opportunity to become U.S. citizens. Among all racial and ethnic groups, few support offering them permanent resident status that stops short of citizenship. White Americans (23%), however, are significantly more likely than API (15%), black (12%), and Hispanic Americans (7%) to support identifying and deporting all immigrants living in the country illegally. However, there are significant differences in opinion among white Americans by educational attainment. White Americans with a high school degree or less are much less likely than white Americans with a college degree to favor a path to citizenship for immigrants living in America illegally (54% vs. 65%, respectively), and are about twice as likely to support identifying and deporting these immigrants (30% vs. 16%, respectively). In contrast, the educational divides among Hispanic Americans are much smaller. Hispanic Americans with a high school degree or less (66%) are as likely as Hispanic Americans with a college degree (65%) to express support for providing immigrants currently living here illegally with a path to citizenship. Black Americans also show less variation in opinion by educational attainment: two-thirds (66%) of black Americans with a high school degree or less support a path to citizenship, compared to about seven in ten (72%) black Americans with a college degree. 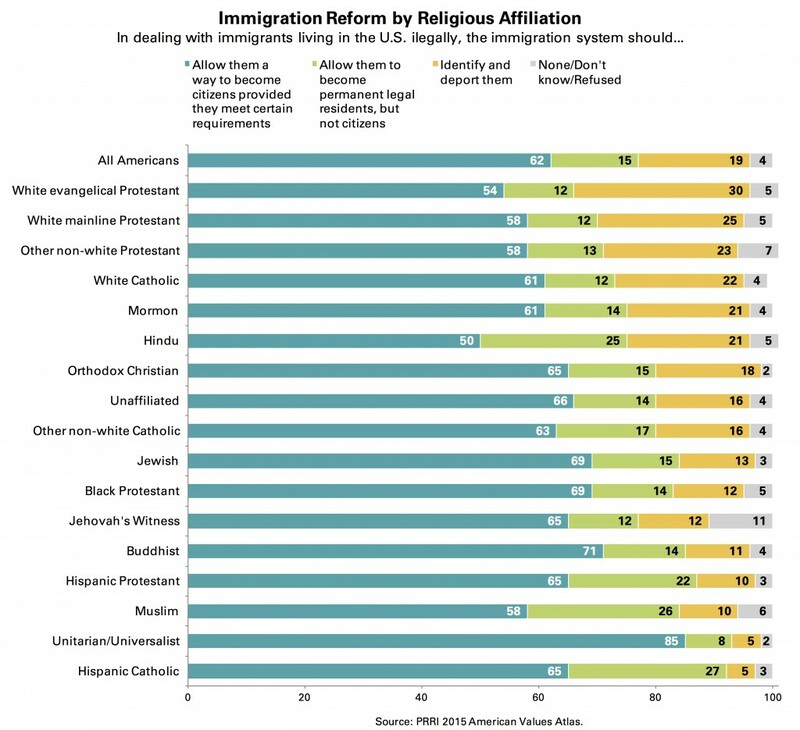 Immigration reform policy preferences also differ significantly by religious affiliation. Support for a path to citizenship is highest among religiously unaffiliated Americans and among non-Christian and non-white Christian groups, including among Unitarian Universalists (85%), Buddhists (71%), black Protestants (69%), Jewish Americans (69%), the religiously unaffiliated (66%), Hispanic Protestants (65%), Hispanic Catholics (65%), Jehovah’s Witnesses (65%), and Orthodox Christians (65%). Approximately six in ten white Catholics (61%) and white mainline Protestants (58%) also back a path to citizenship. The religious group most likely to support deportation is white evangelical Protestants; three in ten (30%) say immigrants living in the U.S. illegally should be identified and deported. However, even within this group, a majority (54%) support a path to citizenship. Notably, three of the four religious groups most likely to support identifying and deporting all immigrants currently living in America illegally are white Christian groups: white evangelical Protestants (30%), white mainline Protestants (25%), and white Catholics (22%). 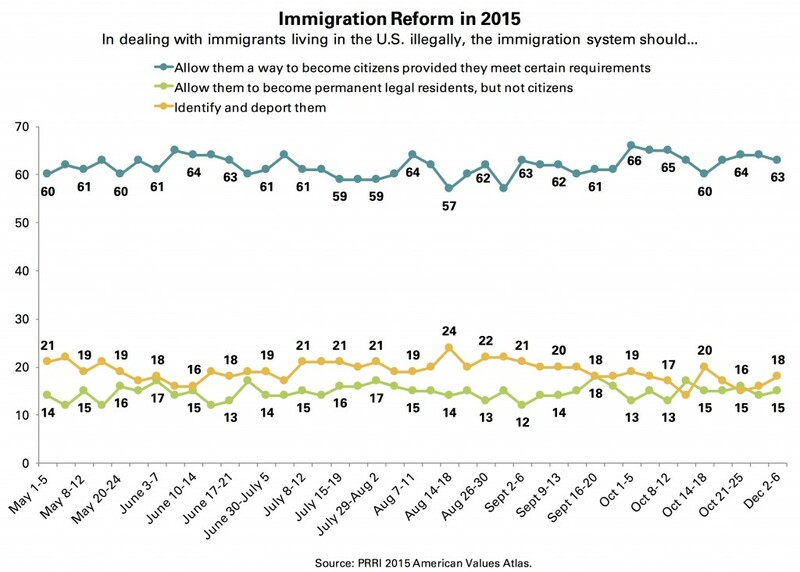 American attitudes on immigration reform are sharply polarized by political affiliation. More than seven in ten (72%) Democrats support providing illegal immigrants with a path to citizenship, compared to a slim majority (52%) of Republicans. The option of providing immigrants living in the country illegally with permanent legal resident status is unpopular among both Democrats (14%) and Republicans (14%). While only about one in ten (11%) Democrats support identifying and deporting illegal immigrants in the U.S., three in ten (30%) Republicans back such a policy. The attitudes of independents are nearly identical to the attitudes of Americans overall. There are notable ideological divisions within each of the parties, however. While nearly six in ten liberal (59%) and moderate Republicans (59%) support a path to citizenship, fewer than half (49%) of conservative Republicans express the same opinion. The ideological gap is even larger among Democrats—approximately eight in ten (78%) liberal Democrats support providing immigrants living in the U.S. illegally with a path to citizenship, compared to 69% of moderate Democrats and 63% of conservative Democrats. Republican attitudes on immigration reform policy also vary significantly by age. More than six in ten (63%) young Republicans (age 18 to 29) support providing immigrants currently living in the country illegally with a path to citizenship, while just one in five (20%) prefer identifying and deporting these immigrants. Older Republicans, in contrast, express much lower support for a path to citizenship. 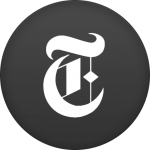 Fewer than half (47%) of G.O.P. seniors (age 65 and older) favor allowing illegal immigrants to become citizens provided they meet certain requirements, while more than one-third (34%) support deportation. There are minimal regional divisions in attitudes about immigration reform policy. Residents of the Northeast (65%) are the most likely to express support for a path to citizenship, followed by residents of the West (63%), Midwest (60%), and South (60%). Support for providing a permanent legal resident status has little support among residents of the West (16%), Northeast (15%), South (15%), or Midwest (14%). Residents of the South (21%) and Midwest (21%) are only slightly more likely than those living in the West (16%) and Northeast (16%) to prefer illegal immigrants be identified and deported. With the single exception of South Dakota, majorities in all states support a path to citizenship. The states with the highest support for providing immigrants living in the U.S. illegally with a path to citizenship tend to be clustered in the Northeast and along the West Coast. 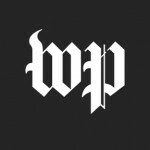 Approximately two-thirds of residents in Washington (68%), Connecticut (67%), New York (67%), Rhode Island (67%), Massachusetts (66%), and Oregon (66%) back a path to citizenship. 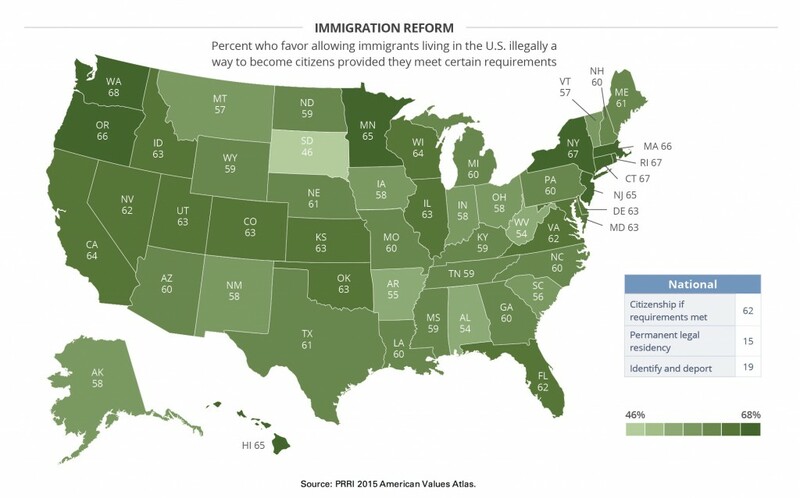 The lowest support for the path to citizenship policy can be found predominately in Southern states, such as South Carolina (56%), Arkansas (55%), Alabama (54%), and West Virginia (54%). Support for a path to citizenship is lowest in South Dakota, where fewer than half (46%) of residents back this policy option. Click here for a 50-state table of views on immigration reform. Perceptions of immigrants are strongly associated with support for immigration reform. Nearly three-quarters (74%) of Americans who believe that immigrants strengthen American society favor allowing immigrants living in the U.S. illegally to become citizens if they meet certain requirements. Sixteen percent of Americans with a positive view of immigrants say that they should be allowed permanent legal residency status but not citizenship, while fewer than one in ten (8%) are in favor of deporting immigrants living in the U.S. illegally. Notably, even among Americans who believe immigrants are a threat to American culture, more favor a path to citizenship than deportation. Nearly half (46%) of Americans who say immigrants are a threat to traditional American culture and way of life favor providing a way for illegal immigrants to gain citizenship. Only 13% say they should be allowed to become permanent legal residents, but notably, nearly four in ten (37%) say immigrants living in the U.S. should be identified and deported. Jones, Robert P., Daniel Cox, Betsy Cooper, and Rachel Lienesch. “How Americans View Immigrants and What They Want from Immigration Reform: Findings from the 2015 American Values Atlas.” PRRI. 2016. http://www.prri.org/research/poll-immigration-reform-views-on-immigrants/. Does Trump Speak for the GOP on Immigration?